a windows 8.1 dell computer. "The folder was gone but a five triangle folder appeared below"
When you use WFH to hide a file/folder, WFH will create a new folder on root directory to save hided files/folders. 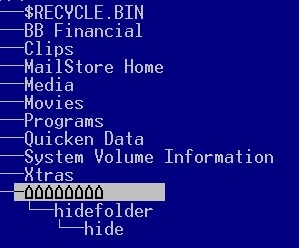 Usually, user cannot see this new folder, but some software which get file/folder info directly from system FAT (File Allocation Table) will display this new folder. It will be shown as five triangle or other. Even though you can see the hidden files/folders, but you cannot operate it (open/copy/delete...), they are protected by WFH. Can you tell me, how did you see this five triangle folder? We need to do some tests.